Becoming a hijabi means changing the way we are used to dressing. There is a right and wrong way of covering. 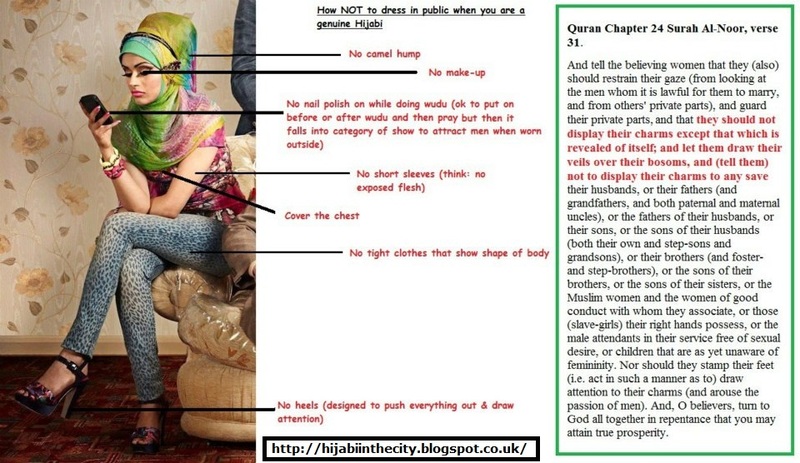 Click on the image to see some of the things NOT to do as a hijabi. Remember that you are representing all Muslim women and all of Islam when you present yourself in public. As the point of hijab is to protect against men's looks and to preserve modesty, tight clothing, excessive make-up etc is not in the spirit of hijab. Hijab is a process for some. If you are struggling, then just pick one area and focus on changing that, you'll soon find yourself in a new habit of correct hijab inshallah.